It's Friday! What are you up to this weekend? Hopefully you can use some of these recipes! Cut ends off the eggplant. Slice eggplant in half, then into 1/4 inch thick slices. Lay each slice on the cutting board and cut into 1/4 inch strips. Be sure to cut all the strips the same size so they cook evenly. Place eggplant strips in a bowl and season with olive oil, salt and pepper. Set aside. Combine breadcrumbs and parmesan cheese in a bowl, and egg whites in another. 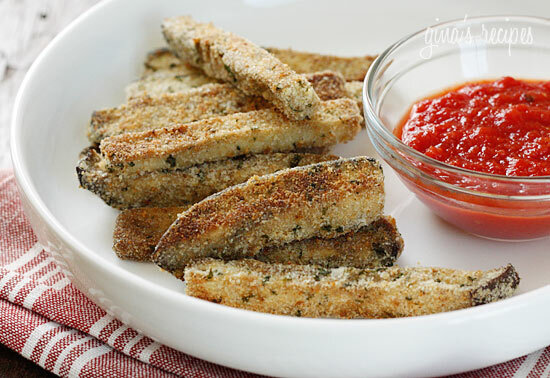 Dip a few strips of eggplant at a time into the egg whites, then into the breadcrumbs. Using a fork, remove eggplant from crumbs and place on the baking sheets. Spray with more oil and bake 10 minutes in the middle rack. Turn over and bake an additional 5 minutes, or until golden. Serve hot. 1- Pour oil into the bottom of a non-stick skillet, about 1/2" to 1" deep. 2- In a small bowl combine the flour, garlic powder, and salt and pepper. Stir well to combine. 3- In a separate bowl combine the egg and milk, beating well to combine. 4- Dip the chicken first in flour, than egg mixture, than flour. Repeat until all chicken is coated. 5- Lightly fry until all chicken is cooked. Drain on paper towel and season with salt. 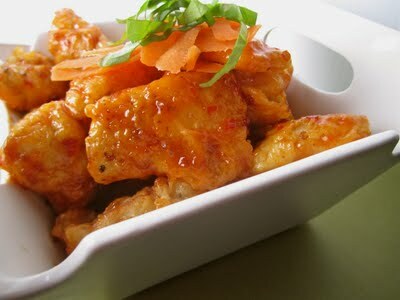 6- Toss gently with the sweet chili sauce. Serve hot. Preheat oven to 350 degrees. Place cooling rack over baking sheet and spray lightly with non stick cooking spray and set aside. On a large cutting board, slice bacon strips into 4 sections to get 20 small slices. Cut two chicken breasts into 20 bite-sized pieces. To assemble, place a scant teaspoon of blue cheese on top of a piece of chicken. Place a strip of bacon on top of the blue cheese and stretch it around the piece of chicken, securing it with a toothpick. It’s fine if the bacon doesn’t stretch the entire way around! Place on baking rack, with the blue cheese facing up. In a small bowl, mix bbq sauce with a little water to thin it out and baste the chicken bites. Place into preheated oven and bake 15 minutes. For crispier bacon, switch the oven to broil and cook until desired crispiness is attained. You may have to flip your chicken bites to crisp up all sides. Remove from oven and serve. Oh. My. God. These food items just got better and better as I scrolled! 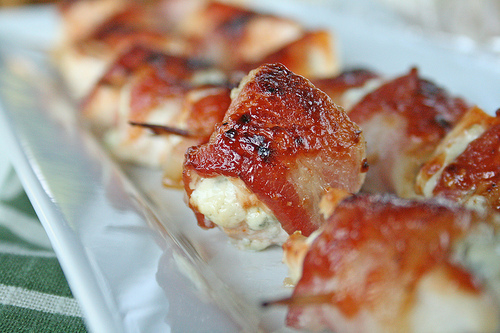 Bacon wrapped blue cheese? I'm drooling at my desk right now. Killin' me!